Shop Handmade and Save the Rainforest! Shop Handmade While Saving The Rainforest!! Shop Handmade and Save the Environment!! ShopHandmade is Free. Really. There is no monthly charge. There is no listing charge. There is no mandatory sales commission. There is no "professional" option to upgrade to. You don't have to get your friends to pay $70 a month so your account can be free. There is no limit on the number of listings you can have. Our service is free because it is advertiser sponsored. When you list an item you choose from one of several sponsors who will pay us the 25¢ listing fee. The more items you list, the more money we make, but not from you. Commission: You can choose any commission you wish. 0% is fine. eBay charges 12%. You pick what you think is fair. We thank you if you do. Rainforest protection: Choose to pay 10¢ or 25¢ to help protect the rainforest, which you pay only when your item sells. It's optional, but it's a good thing. 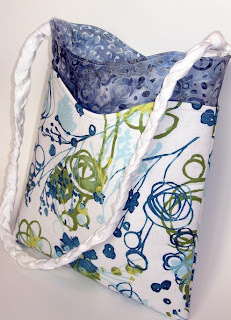 Summer Fun Purse / Shoulder Bag. Cloth / Fabric. 8 Pockets. This cloth, handmade, one of a kind purse is fun and not too large or too serious. It's for every day wear, and would go great with summer casual, shorts, jeans, anything denim, and more. It's made of 100% high quality cotton fabric, inside and out. Fabric consist of a designer style that has a painted effect in shades of blue and green on a white background. It pairs well with 2 different batiks - one on the outside, and the other on the interior as the lining material. 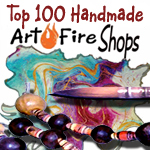 Check out the Top 100 Artfire Shops! Will be adding Artfire Shops Soon!! 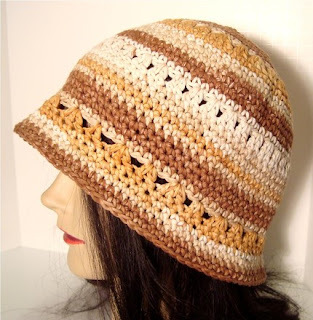 This cloche hat is handmade from 100% cotton yarn. It's perfect for all seasons. This hat fits most adults with a head circumference of 21" to 23". Check out our other items as new ones are constantly being added. You're sure to find something absolutely unique and hip for you or to give as a thoughtful and original gift! For even more cloche hats check out my other etsy shop MelsBellsClocheHats. Please contact LoopOverLoop if you would like a custom item in another color etc. All of our items come from a smoke-free and pet-free environment. This hat is machine washable and dryable.Shipping is FREE in the USA! I LOVE IT!! Im so excited and honored, to be sporting a NEW one of a kind banner and avatar, made by MissBeeDesigns. If your in the market for a cool banner and avatar, MissBeeDesigns would love to design one for you.